Using water , knead into a smooth dough. Set aside. 2 medium sweet potatoes , cooked soft. (I just stab it with a knife all over and put in the microwave for about 5-7 minutes until soft). Peel and mash the sweet potatoes. Add the remaining ingredients and mix thoroughly. The mixture should be fairly smooth and dry. Take a ball of the dough, about the size of a small lemon. Roll it into a disc about 4 cm in diameter. Place about 2 tbsp of the filling in the center. Roll out another disc of the dough to the same size. Moisten the edges of this disc with water and place on top of the disc containing the filling. Press down on the edges to ensure a tight seal. 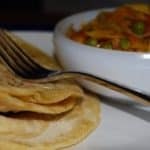 Using some flour, roll out the paratha to about 7 cm in diameter. Place the paratha on the griddle and cook until golden-brown spots appear. Flip and cook the other side, applying a little oil if necessary. Serve hot with the cabbage subzi.